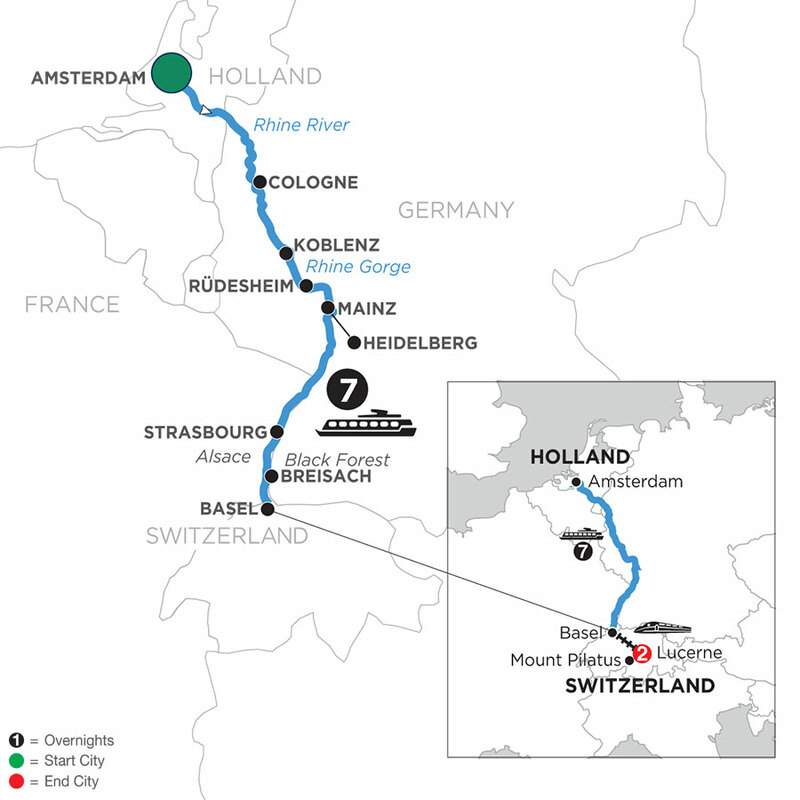 Your 10-day river cruise vacation includes stays in Holland, Germany, France, and Switzerland—all beginning with your Avalon scenic river cruise embarking from Amsterdam. Before sailing down the Rhine River, you’ll enjoy a guided canal cruise through the colorful city of Amsterdam. Next, you’ll cruise to Koblenz—with 2,000 years of history in its monuments, fortress walls, and towers. Later, relax on the Sky Deck of your ship as you pass through the spectacular Rhine Gorge on your way to Rüdes-heim. You’ll take a guided tour of Rüdesheim’s outstanding Mechanical Music Museum. 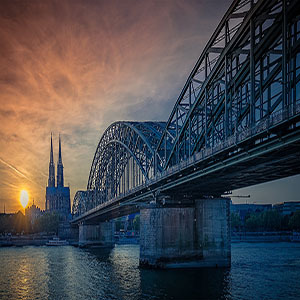 Sail into Mainz for a city sightseeing, including a visit to the impressive Gutenberg Museum or choose an ex-cursion to nearby Heidelberg—and cruise to Strasbourg, France. Then, stop in Breisach, Germany, the gateway to Germany’s Black Forest—an area of unrivaled natural beauty—best known for Black Forest ham, cherry cake, and the cuckoo clock. You’ll sail to Basel, Switzerland, to disembark from your Avalon Suite Ship® and continue your European va-cation tour with a visit to Mt. Pilatus and a walking tour in Lucerne. With services provided by Monograms®, you’ll have a Local Host® to arrange your sightseeing, free-time recommendations, and any other assistance you need during your 2-night stay in Lucerne. Your scenic river cruise on the Romantic Rhine River, and complete vacation package in Switzerland are the perfect combination to unlock a guided European vacation of a lifetime. The Avalon Artistry II delivers an intimate setting, along with two full decks of suites featuring Wall-to-Wall Panoramic Windows that transform the living space into a unique Open-Air Balcony®. With 200 square feet, Panorama Suites are more than 30% larger than the industry standard, giving you the rare opportunity to wake each morning to the enchanting scenery and fresh breezes. Onboard amenities include a complimentary Internet Corner and Wi-Fi access, an expanded Fitness Center, and a spacious Sky Deck with premium lounge chairs, shade system, whirlpool, and the delightful Sky Bistro.